I’ve got a cup of tea, some bread just out of the oven, a roof overhead, and a high-def, wide-screen TV which for hours has given me a window on the tragedy of a nation with virtually none of the above – just destruction and death. I noticed on the CNN news-crawler at the bottom of the horrible scenes from Haiti that President Obama just pledged $100 million for emergency assistance. The amount – well, it’s good start. But I bet folks all cozy, like me, can add at least that much to the cause of helping a poor, besieged neighbor in the wake of an earthquake that is clearly among the worst natural disasters in recorded history. Raising the money would be a snap – just a million Americans, donating at least $100 each, would match Obama’s $100 million. You can find a list at www.cnn.com of organizations engaged in relief efforts in Haiti, and pick one or more to receive your contribution – or find another from any of the many listings compiled by the print and broadcast media. I chose the American Red Cross (http://www.redcross.org) , Catholic Relief Services (http://www.crs.org), IMA World Health (http://www.imaworldhealth.org), and Doctors Without Borders (http://doctorswithoutborders.org). Now, if just another 999,999 folks could join in this little effort – well, we’ll all be contributing members of an enormous organization: Humanity. There’s no membership card, but gifts to most if not all of the relief organizations are tax-deductible. And when you figure out how much your tax savings amounts to, use that money for another gift later. I attended the memorial service today for my friend Mark Owings, a fellow founding member of the Baltimore Science Fiction Society. His wife Jul noted that he died amid his collection of some 15,000 books -- appropriately enough, sitting in a chair with a volume he was reading in his lap. "He died with his boots on," she told friends attending the brief service at St. Luke's Lutheran Church, a short walk from their home in Baltimore's Hampden neighborhood. Mark, who had a long white beard, had been scheduled to reprise his role as Father Time for Hampden's annual New Year's Eve ball drop, but died on Dec. 30 -- barely a month after being diagnosed with pancreatic cancer. 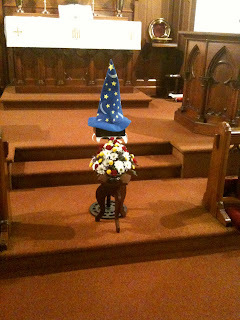 David Chalker -- the elder of two sons of another club co-founder, the late Jack Chalker -- kindly snapped the photo above with his iPhone: The box containing Mark's ashes, topped by his wizard's hat. Not in the photo, but high above on the wall behind the altar, was a large painting of Jesus -- described by one of the science fiction friends in attendance as "another master of space and time." I'm not particularly religious -- OK, I'm not religious, period -- but the wizard hat, the juxtaposition and the comment were wonderful. I'd rather smile than cry at a funeral. Baltimore’s best-known socialist attracted what may have been his largest crowd Wednesday afternoon, but wasn’t around to enjoy it. A. Robert Kaufman, a far-leftist who had been tilting at societal windmills for more than half a century, died on Christmas Day after more than three years of declining health – a result of being stabbed by a deranged boarder in a building he owned in a rough westside neighborhood. He was 78. More than 100 people from varied walks of life offered condolences to Bob’s elderly sister – his sole survivor – and heard tributes from former newspaper columnist Mike Olesker, from influential African-American minister Marion Bascom, from a printing company entrepreneur who for many years had Bob as frequent customer, and even from a young man who described himself as a revolutionary socialist inspired by Bob’s example. I probably met Bob no more than twice, but talked to him regularly over the course of nearly four decades on the city desk of The Baltimore Sun. He called frequently, hoping to talk to editors. I was the guy usually answering the phone. It was a curious relationship. I’d hear what he had to say, and send a brief message off to whatever editor he wanted to reach (but who had no time or inclination to chat with Bob). Usually just a sentence, kind of a tweet, about this demonstration, that hearing, his latest filing for elective office. There was hardly a public office that Bob didn’t run for – mayor, council, congress, president. The point was never about winning. It was about the forum that comes with candidacy, the chance to espouse his views that in the short run of a campaign or a decade were largely ignored or brought him mostly derision. Crazy stuff, you know – starting in the late 1940s, as a white Jewish teen-ager joining in civil rights picketing outside a whites-only downtown theater. He opposed war, opposed the death penalty, favored legalizing drugs, spoke out for universal health care and affordable car insurance, and wanted big business to share the wealth. Sometimes it was a chance to criticize the political system when, deemed a minor candidate, he would be barred from an election debate. He was roughed up and stuffed in a trash can back around 1960 outside Baltimore City College, by a mob of students who also tore up his socialist leaflets. I missed the ruckus, but Olesker, who was in my 10th-grade homeroom, recalled seeing the mob that day. It might have been Bob’s biggest crowd before Wednesday’s memorial, we joked. Bob was uncompromising in his beliefs. If there was movement on his issues, it was society that did the moving – as witness the election of a black president, debate on universal health care on Capitol Hill, growing disenchantment with the latest war, city council eyeing the high cost of car insurance for Baltimore residents. But in his last two years, living in a nursing home, Bob was pretty much a spectator badly in need of a kidney – his own kidneys having failed as a complication from the knife attack and subsequent infections. He had nearly died after the attack. More recently, he had a stroke. Olesker, in his remarks, said Bob “could really make people uncomfortable because we were not living up to our ideals” – and neither was America. After the Kaufman remembrance, I drove across town to attend another memorial gathering – this one for longtime friend Mark Owings, who was among the handful of founding members of the Baltimore Science Fiction Society. He was the most gentle, soft-spoken human being I have ever known. For those unfamiliar with the tale, I found myself at age 16 becoming close friends in high school with future novelist Jack Chalker and traveling by Trailways bus with him and a few other fans of the genre to attend meetings of the Washington Science Fiction Association. I suggested starting a club in Baltimore, and the first official meeting took place in the tiny basement of my parents’ Royce Avenue rowhouse. We also started holding an annual regional science fiction conference, which initially attracted a few dozen people, but grew to major proportions over the years – 1,500 or more, and filling hotels. There’s even been a couple of larger world science fiction conventions here. While I drifted away from active membership, Jack and Mark remained involved in BSFS and collaborated on a couple of book projects that drew on Mark’s strength as a bibliographer: The Index to the Science-Fantasy Publishers and The Revised H.P. Lovecraft Bibliography. Jack died nearly five years ago. Now Mark, on Dec. 30, at 64 – mere weeks after being diagnosed with pancreatic cancer. The last time we had our picture taken together was in 2003, at BSFS’ 40th anniversary party – held in its spacious clubhouse, a former East Baltimore Street movie theater building. RIP, Mark. And tell Jack I said ‘hi’.